What worries you most about this constitution that is in the works? A constitution that is the result of a lot of investment and sacrifice should be in the interests of the nation and its people. It should be in the interest of the Nepali common man, whether they are in the Himalayas, the foothills or the Terai. But the draft tabled doesn’t seem to be of this kind. What is most worrying is that this constitution will again fail in a few days, months or years. This has raised the possibility of new rebellions being born. Why do you say the constitution in this form will fail? The most important reason is that this constitution goes against the sentiment of the Nepali people. It doesn’t look like it has taken into account the sentiments of all the sides and regions. It lacks the intent to fully arm the people with their rights. The existing forms of discrimination in the nation have been allowed to remain in the writing of the new constitution. Hence, it isn’t the nation’s obligation to stop the discrimination. What about the Bahujan sentiment? This draft constitution is clearly not in the interest of the majority Bahujan Nepalis. And a constitution that goes against the interest of the majority won’t last and won’t be acceptable. The intent has been to keep these Nepali citizens – belonging to those societies, communities, regions, linguistic groups deprived of a stake in the main centres of power – out of the influence of the state in the drafting of the constitution. This situation prevents the nation from being prosperous, and the democracy from being strong and permanent. Therefore, while drafting a democratic constitution, democratic principles and processes, and systems based on democratic forms and processes, should be put in place. As long as this is not done, there will always be voices of dissatisfaction and dissent. How have 601 representatives in the Constituent Assembly not been able to think about the interests of the Nepalese people? This is not about 601 individuals. Some of the parties in the Constituent Assembly and some of their leaders, with all due respect, are likeminded in their casteism. Some of them have dictatorships. Because some of them run dictatorships, the constitution is not being written for the common, majority Bahujans represented in the Constituent Assembly. The constitution that goes against social justice is being boycotted, burnt, torn and opposed by society. Why can’t some likeminded members of the Constituent Assembly team up and fight this attitude? The members of the Bahujan majority community are spread over different political parties. The members of these political parties are living in slavery. Their role in the Constituent Assembly is zilch. What I understand is either they aren’t willing to or haven’t been allowed to speak during the making of the Constitution. They should have been present there having recognized the need to speak during the process of Constitution making, but that hasn’t been the case so far. You had mentioned in your speech at the seminar organized by the Bahujan Diversity Mission at the Constitution Club, New Delhi, that Pushpa Kamal Dahal (chairman, Maoist party), K.P. Sharma Oli (chairman of the Communist Party (UM-L) and Prime Minister Sushil Koirala (also president of Nepali Congress) have been running the show in the Constituent Assembly, that only their views count? That’s right. No one else contributes to the decisions. Sometimes, they threaten their party men and sometimes they offer inducements. This is how the constitution is being drafted and agreed upon. The draft is the result of an agreement between Sushil Koirala, K.P. Sharma Oli and Pushpa Kamal Dahal and doesn’t seem to have the merchanisms to protect the Bahujan majority’s rights. Even though the draft that goes against the rights of the Bahujan majority has been opposed, the three of them have stuck to their stand, pushing for the passage of the draft and releasing it to the public. Therefore, if the constitution is written going by what the three of them say, it won’t last. The constitution has to be written. The process of writing the constitution should not stopped. But Pushpa Kamal Dahal, K.P. Sharma Oli, and Sushil Koirala should have realized that they can’t draft a constitution that goes against the interest of the deprived communities and society. What have these three leaders found common among themselves despite belonging to parties with starkly different ideologies? All three have the same DNA, they have the same intention. What do you mean by the same DNA? They belong to the same race. Yes. Then they have come together to bargain for power. They’ve forgotten that they need to work towards a change that the country and its people need. Why so? Because they don’t wish for a constitution that brings about a change. It’s not enough saying Nepal will be an inclusive and secular republic and democracy and that the people will have the rights. These mere words won’t enable the Nepali citizens to get their rights. These are ideals. These ideals are also written in emotions and imaginations. With just these ideals, they won’t be able support the Nepali people in their daily efforts to sustain themselves. The situation so far has been the rulers covering up the reality – of citizens who are suffering, exploited, persecuted and neglected and those who are deprived from the influence of state – by cheating and lying to the rest of the world. They are planning again for such a rule – for a so-called democracy – by going against democratic principles and processes. There’s a massive opposition against this state of affairs. Our first demand is social justice for Nepal’s deprived sections of society. Dalits, OBC, minorities, the poor should enjoy a stake, proportionate to their share in the population, in all aspects of the state. Second, there should be a special provision for a Diversity Act in the constitution. Third, the corrupt, smugglers, black marketers and enemies of the state should be punished with death. There should be a constitutional provision for nationalization of their property. Rapists should also be hanged and their properties nationalized. There should also be a provision for life sentences. Fourth, today, the centre and the provinces are far apart. The centre does not want to give anything to the provinces. We are for giving 70 percent of the powers to the provinces, which in turn should forgo 70 percent of the powers to the local bodies. Fifth, ration cards, clothing cards, free-education cards, health cards should be provided. From the Rana era to the kings’ Panchayati rule to the present rule of democratic governments, there haven’t been any subsidies, even on a kilo of salt. We have submitted these demands for discussion. A document signed by Sushil Koirala, K.P. Sharma Oli, late Surya Bahadur Thapa and myself was acceptable to everyone but now that’s been rejected. After the 16-point agreement, the earlier document has been set aside. But some aspects of the 16-point agreement are against the interests of Nepal and the Nepali people. This is why this draft is of a constitution that doesn’t make sense. I told the assembly, Sushil Koirala, K.P. Sharma Oli and Prachanda just that. What this means is that democratic principles and processes haven’t been followed in the making of this report. You said in your speech this afternoon that ever since Modi mentioned about passing the Constitution by consensus, there has been a change in attitude in the Constituent Assembly. What Prime Minister said in his first speech was very good. But after he visited again and stressed the need for a consensus, there have been efforts to cut back on the rights of the Bahujan majority in the draft constitution. Was Prime Minister Modi indirectly trying to say that the new constitution should not guarantee rights to the Bahujan majority or the Dalits, Adivasis, OBCs and Muslims? This is how the prime minister’s utterance of the word “consensus” has been perceived. The Indian prime minister should understand what he said then and what he needs to be saying today. The problems of the Bahujan majority in India and Nepal together appear to have not been addressed in reality. On 25 July, around a dozen well-known intellectuals participated in a seminar in New Delhi on partnering in the making of the new Constitution of Nepal. The seminar was organized by the Bahujan Diversity Mission. 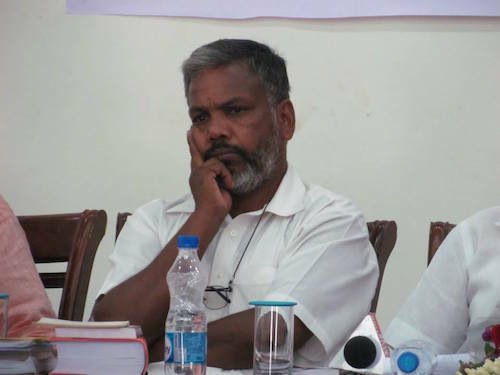 Vishwendra Paswan, known as the Ambedkar of Nepal, was present. Paswan has been visiting India time and again for the past several years. He has been persistently pushing for representation of Nepal’s Dalits, Tribals, Backwards and minorities, in proportion to their populations, in every sphere of life. After parting ways with Maoist leader Prachanda, the Bahujan Maoists have also been raising a similar demand. However, the promise of representation is confined to the preamble only and no provision has been made in any article of the document for implementing it. Protesting against this anomaly, Vishwendra Paswan and the Bahujan Maoists publicly tore up and burnt copies of the draft constitution. They are still fighting to ensure that the deprived sections get their due in the constitutional provisions. Among the speakers at the seminar was Dalit thinker Chandrabhan Prasad, who is credited with initiating the diversity discourse in India. The programme host was Dr Lalji Prasad Nirmal. The speakers sought to know whether the Constituent Assembly would concretise its resolve to create an equitable society – as expressed in the preamble – by incorporating suitable provisions in the constitution.